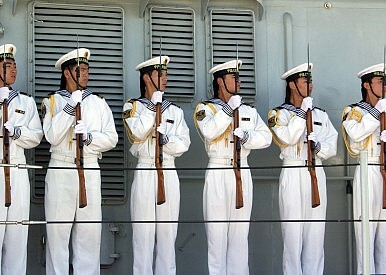 China’s military celebrates its 88th anniversary as it prepares for new threats. On Saturday, the Chinese People’s Liberation Army (PLA) turned 88, a particularly auspicious number given the connotations associated with the number eight in Chinese culture. As the PLA celebrated 88 years since its founding on August 1, 1927, its official newspaper, the PLA Daily, reportedly stressed growing threats to the integrity of China’s borders, including its disputed maritime claims in the East and South China Seas. According to Reuters, the PLA Daily ran a front page editorial emphasizing a growing risk environment for China. “The situation surrounding our country is generally stable, but the risks and challenges are extremely severe, and the possibility of chaos and war on our doorstep has increased,” it said. “The maritime security environment is more complicated, and the undercurrents in the East and South China Seas have been gushing up,” the PLA Daily editorial continued. The editorial echoed some of the sentiment expressed in China’s recently released 2015 defense white paper, which The Diplomat covered in more detail earlier this year. While that white paper noted the PLA’s growing role as a global military, it emphasized the need for China to pay heed to its immediate strategic environs, including in China’s near seas. Critically, the white paper noted the continued relevance of Taiwan as the PLA’s primary war-fighting scenario. While Chang’s remarks emphasized the importance of the Taiwan issue for the PLA, the organization has transformed considerably over the past decade. Particularly in the maritime domain, the PLA Navy is beginning to take on a special importance in China’s national security strategy. As China’s 2015 white paper noted, the PLA is beginning to leave behind “the traditional mentality that land outweighs sea,” a significant change in how the country thinks about the role of its military. In turn, the PLA Navy is swiftly turning into an expeditionary force, capable of projecting power far beyond China’s borders.